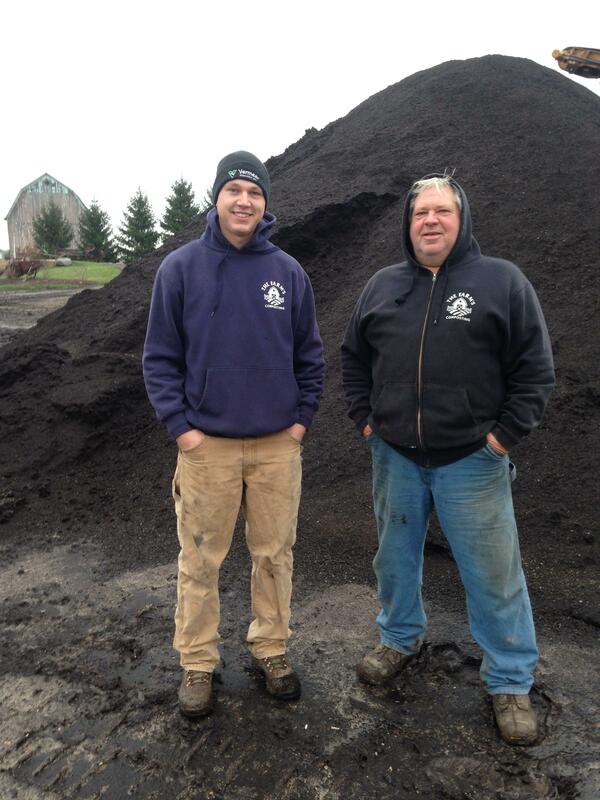 Wednesdays and Sundays, Compost Crusader delivers loads to Jutrzonka's operation in Caledonia. 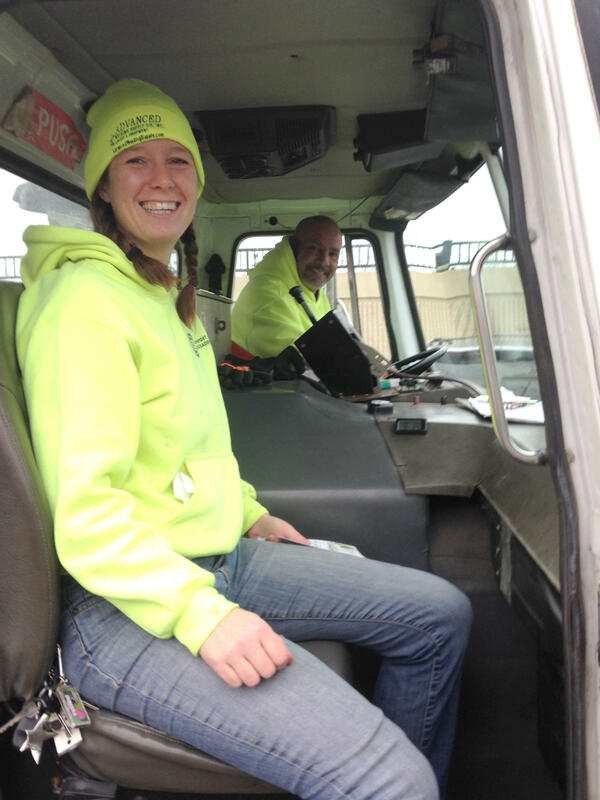 A volunteer retrofited dumpsters to "fit" Compost Crusader's garbage truck. We, Americans, waste a lot of food. Approximately 40 percent is never eaten. That amounts to 34 million tons of waste annually; most ends up in landfills. WUWM Environmental Reporter Susan Bence digs into the problem - starting with her own refrigerator. "You don’t have to go very far from home to experience food waste. Like inside my refrigerator…has some pretty nasty looking red cabbage, broccoli I thought I would make soup out of. And I don’t know what this mush is, could have been cilantro," she says. How much of this will end up in a landfill? According to the EPA, about 95 percent. People in Milwaukee are working to reduce those piles. Behind a grocer in Bay View, Melissa Tashjian jumps out of the garbage truck. She is wearing a neon yellow sweatshirt and cap emblazoned with the words Compost Crusader. "Right now we’re calling (the truck) Betsy. This is our number one truck that we got with part of our second KIVA loan for $10,000," she says. "We purchased from Craig’s List." This is her twentieth stop of the morning – picking up food scraps. Tashjian launched Compost Crusader in early 2014. It’s a for-profit business. Granted, so far, the only person drawing a salary is her driver. "I would like for Milwaukee to see how easy it is. To see the full potential of organics diversion," she says. "Just like recycling, there is successful ways to dispose and repurpose this material that doesn’t necessarily have to break the bank." So far, Betsy hauls two loads a week. "Last month we diverted our most ever, which was 105,000 pounds," Tashjian says. At the disposal point about 15 miles away in Caledonia, there are mounds of compost stretching across 16 acres. Over the generations, the Jutrzonka family has evolved from dairy farmers to landscapers to this latest iteration. "My dad and I are the owners. We do the daily maintaining of the machinery, turning the wind rows, monitoring the temperatures, I do the bookwork, a little of everything," twenty-eight year old James Jutrzonka says. More than a dozen communities and landscapers deliver their yard and tree waste here. Its transformation to soil takes four to five months, and Jutrzonka has learned that blending in food scraps enriches the quality. "We call it black gold. It’s a high nutrient count, it helps add moisture content," he says. "It’s a richer soil, a richer compost, then say just a carbon source where you use leaves or brush grindings." In 2015, the family created 4,000 yards of compost. That’s enough to top off 133 football fields. While only a fraction comes from food waste, advocates like James Jutrzonka and Melissa Tashjian have a vision. This month, Tashjian's adding customers and composter in Watertown. Jutrzonka hopes the state will ban food scraps from landfills. It did the same with yard waste in 1988. "We’re kind of hoping that will be the next transition is moving to ban the food waste from landfill, to go to a renewable energy company or source or composting," he says. Next, WUWM explores how people are partnering to convert food scraps into energy; so that cabbage in the frig might have a better afterlife. Teams of middle school students around the country have taken on the challenge of “waste not, want not.” It’s the theme of this year’s Future City Competition. The annual challenge is designed to inspire students to latch onto engineering and math. 115 teams representing 20 Wisconsin schools hope to have a chance to compete at the national finals in February. Longfellow Middle School in Wauwatosa gets into Future City in a big way. It boasts 21 teams. Each year, Americans toss out nearly 34 million tons of food – and the vast majority of it ends up in landfills. On Monday, WUWM looked at local efforts to transform food waste to compost. Today, we talk with people converting food into energy. The sun is about to rise as the first customers straggle into Sendik’s grocery store in Mequon. Inside, Jeff Schutte just finished prepping the produce. Most restaurants that compost stick to vegetable scraps and coffee grounds. But one Milwaukee restaurant will soon compost as much as it can - even customers' leftovers - thanks to a new pilot program.